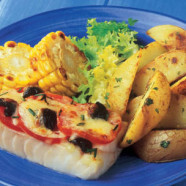 Place the tomato, olives and chives on the fish. Season, sprinkle with the cheese and cook for 8-10 minutes. Garnish and serve with potato wedges, sweetcorn and salad.